Transportation service for every need! Explore the wonderful exhibits of the NASA Space Center in Houston, Texas through the transportation services of C&S Executive Transportation. Declared as the number one car service provider in Houston, our company will take care of your transportation needs to go around this well-known “Space City.” C&S Executive Transportation has a wide range of luxury vehicles that can transport from one up to forty people. We provide chauffeur-driven, top-of-the-line vehicles from a 5-seater luxury sedan to a 40-seater executive coach. C&S Executive Transportation can drive you around town and bring you to the famous NASA Space Center. The Space Center has made Houston known as the “Space City.” Officially known as the Lyndon B. Johnson Space Center, this facility was constructed as a training center for human spaceflight activities. It was designed by the famous Walt Disney Imagineering and is operated by the Manned Spaceflight Educational Non-profit Foundation. 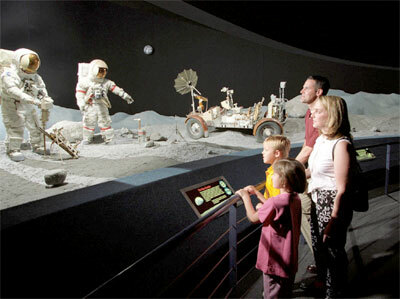 This Houston-based Space Center is known for its many attractions that are open to the public. It is the only space center in the United States where regular people can take a simulated journey throughout space, see the actual training of the astronauts, touch a real moon rock, and view many exhibits. When you visit the Space Center, make sure to bring your passport with you so that they can ink a commemorative stamp on it. Also known as the Northrop Gumman Theater, this is a large screen theatre that shows movies about the outer space adventures. The 5-storey tall screen will really show you life-size images of the outer space and space shuttles. Visitors will really feel that they are in outer space once the film starts rolling. This tour will take you around the entire compound of the Johnson Space Center. This is your chance to see real astronauts in training, the Saturn V Complex, and the Historic Mission Control where the space programs are monitored. This 90-minute tour is all worth it. It will truly inspire the youth to dream of becoming a part of NASA. Taken from the name itself, this is a quick yet memorable experience for both the young and old because it gives a rare chance to touch a real moon rock. There are only 5 moon rocks around the world that can be touched and Houston has one of it. Don’t dare miss this chance! Every summer, the Johnson Space Center launches a series of summer day camps for children ages 4 to 14 to learn a thing or two about space and NASA. Held from June to August, these day camps have varying themes such as Astronaut Training, Hero Science, and even Forensic Science. For the teenagers, they can choose to join the week-long summer camps. For tourists coming from outside of Houston, there are a couple of nearby hotels where you can spend a night or two in. This is the most recommended hotel to stay in for guests who would like to stay near the Space Center. This hotel has a homey feel that guests always feel sad when they are about to check out. Choose from a Studio Suite to a Two-Bedroom Suite; all the hotel’s suites are equipped with a kitchenette and cozy living area. Around 4 kilometers away from the Space Center, this hotel is number one choice for Houston’s transient visitors who are just staying for a night or two. Operated by Hilton, guests are assured to have a “home away from home” feel in this hotel. Tourists and even locals who want to visit the Johnson Space Center can travel in style only with C&S Executive Transportation. Our company is ready to transport you from the airport, to your hotel, to the Space Center, and bring you back to your hotel safely and on time.